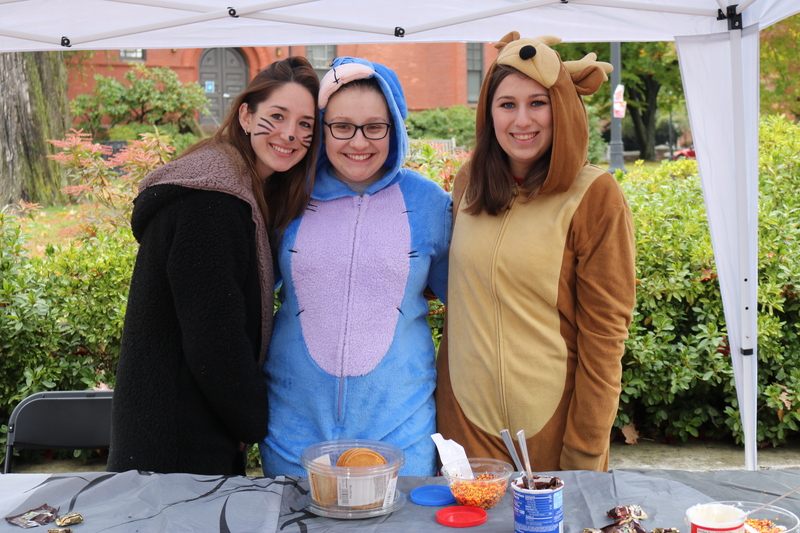 Last week, high school students from the Hartford Magnet Trinity College Academy (HMTCA) attended the Connecticut Supreme Court Justices “On Circuit” program here at Trinity College. 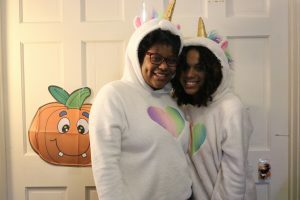 On October 17th, the Connecticut Supreme Court heard oral arguments in one criminal case and one civil case (details below). The program provided students and faculty the opportunity to see the appellate process first hand, and included a Q&A session with the litigators after each case. The Q&A sessions were facilitated by Professor of Public Policy & Law, Glenn Falk. Hartford Magnet Trinity College Academy students in Advanced Placement Government and Mock Trial were a perfect fit for the audience. The defendant Jean Jacques is appealing from his murder conviction. Before his arrest, Mr. Jacques rented an apartment in Norwich, Connecticut on a month-to-month basis, paying rent to the landlord on June 10, 2015. On July 15, 2015, while Mr. Jacques was incarcerated, the police entered the apartment with the landlord’s permission and found evidence which tied Mr. Jacques to the murder, including the victim’s cell phone and a plastic bag containing drugs with the victim’s DNA on it. Austin Haughwout, a college student, sued various administrators at Central Connecticut State University after he was expelled for making statements and gestures related to guns and mass gun violence. Mr. Haughwout claimed that the school violated his right to freedom of speech under the First Amendment to the United States Constitution. Mr. Haughwout is appealing from the trial court decision which upheld his expulsion. He seeks reinstatement as a student and the expungement of his record. Thank you to Urban Educational Initiatives Director, Robert Cotto, Jr. and Renny Fulco, Director, Public Policy and Law Program, for organizing the HMTCA classes to attend this event. This essay was originally published in the Chronicle of Higher Education on September 7, 2018, and appears here with permission of the author. At other liberal-arts colleges, some programs have long recognized the value of practical forms of education. Here at Trinity College, we have a distinctive, longstanding engineering program in which the very practical discipline of engineering is mixed with traditional liberal-arts skills. The logic for such a program is not simply to provide a practical route to employment within a liberal-arts context but also to bring the benefits of a rounded liberal-arts education to future engineers. In truth, none of this should feel foreign. The value of practice, of doing, has long been taught across disciplines in liberal-arts colleges. The value of labs in the sciences has never been in question. Education theorists argue that doing is one of the surest pathways to learning. My discipline, geography, has a longtime commitment to fieldwork as a practice that reinforces the value of classroom learning. Similarly, the arts disciplines insist on the need to actually play music, perform theater, and create sculpture as part of the education. Even in the seemingly rarefied worlds of philosophy, literature, and critical theory, there has been a turn toward worlds of practice and habit, which have too often been subordinated to the heady life of the intellectual. Fully integrating experiential learning into the liberal arts is a bigger step, although with clear benefits for the employability of liberal-arts graduates. 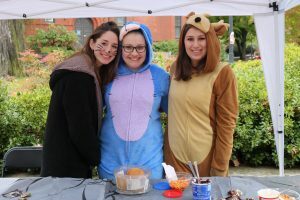 Employers point out that the kinds of things they are looking for in prospective employees include meaningful internships, global experience, civic engagement, and collaboration in addressing real-world problems. These are all features of experiential education. But the benefits of the experiential liberal arts go well beyond employment in specific jobs. When students are encouraged to reflect on, and learn from, an array of experiences, they gain the skills to navigate their way through life and multiple careers. To be most effective, the experiential liberal arts need to follow the general lead of experiential education and go beyond the academic-affairs divisions of our colleges. 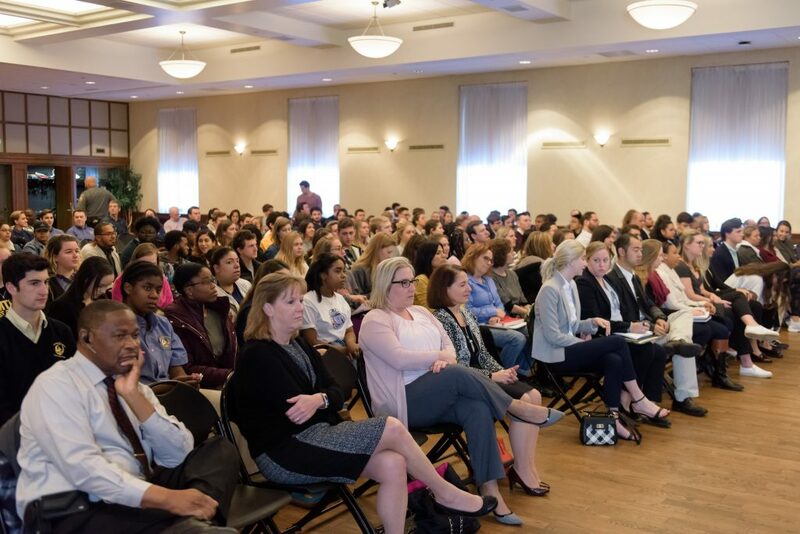 A successful experiential liberal arts will connect to the admissions and recruitment processes before students arrive on campus and to the career-advising and student-success divisions once they arrive. 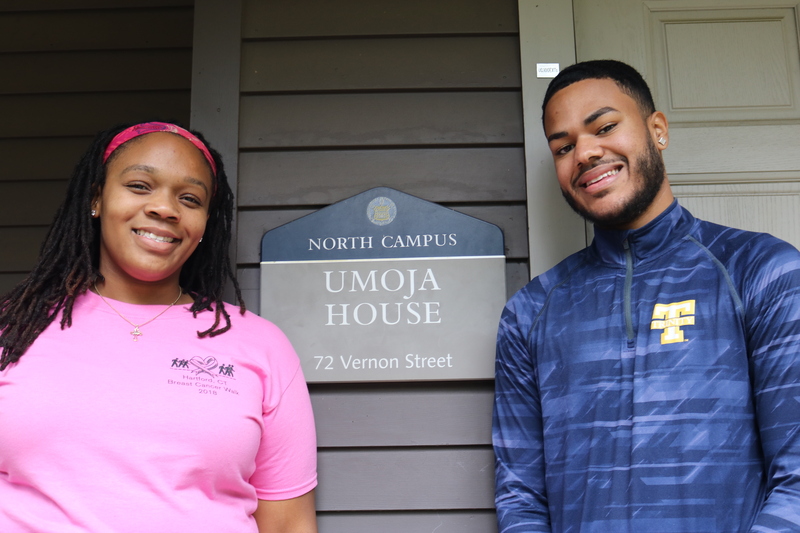 Such a process must recognize that valuable precollege experiences are not simply those that can be bought by well-to-do families, but also life experiences over which students often have little power, such as helping to raise siblings or dealing with an ill parent. Career services and student-­success programs play a role, too. A career office generally fails if it becomes simply a place to visit when you are close to graduation. Offices of career development and student success must be fully integrated into the learning experience throughout the years of college. Administrators and faculty and staff members across all divisions of a college need to go about the business of curating an educational experience that creates the habits of mind conducive to continuous reflection and lifelong learning — habits that promote exactly the kind of self-knowledge that advocates of the liberal arts have always promoted. For 29 years, Trinity College has hosted the annual “Halloween on Vernon Street.” This event, held on the Sunday before Halloween each year, provides a space for children in the Hartford area to come trick-or-treating, make crafts, and play games to celebrate Halloween. Yesterday, Trinity Greek life organizations and cultural houses such as Umoja House and La Voz Latina opened their houses on Vernon Street where they provided candy, games, and music for families in the Hartford area. 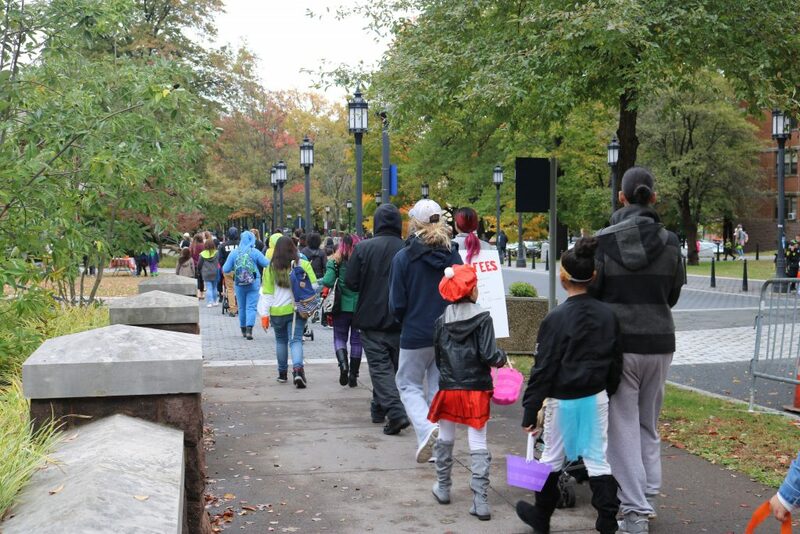 Children and parents in costume with trick-or-treating bags lined the sidewalk awaiting check in with the organizers from ACES (Annual Community Events Staff). 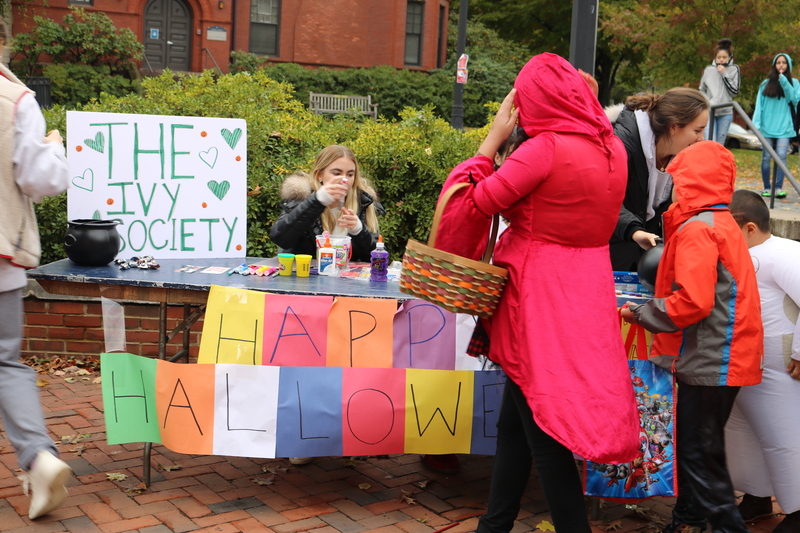 Once at the front of the line, groups of families were linked with a student volunteer who showed them the circuit around Vernon Street where they collected candy, played games with Trinity students, and of course checked out everyone else’s costumes. Our personal favorite was the inflatable dinosaur. 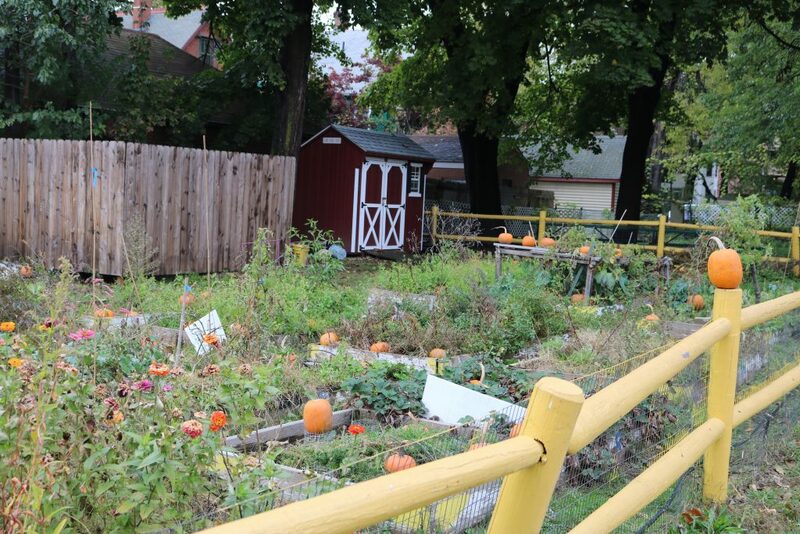 At the end of Vernon Street, at Trinfo.Cafe, sat the goldmine of all Halloween celebrations: the Trinfo pumpkin patch. 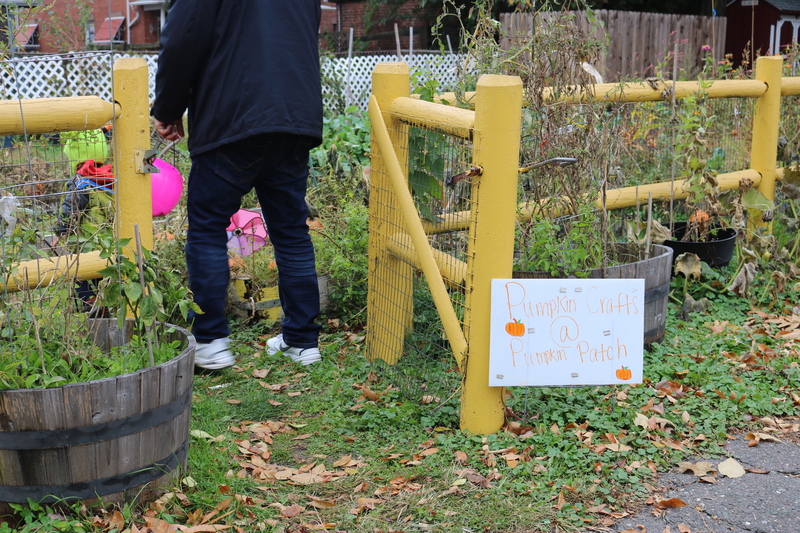 Parents and kids alike were sent into the garden to search for their perfect pumpkin, and then brought it over to volunteers to make sure all the dirt was cleaned off an it was ready for decoration. 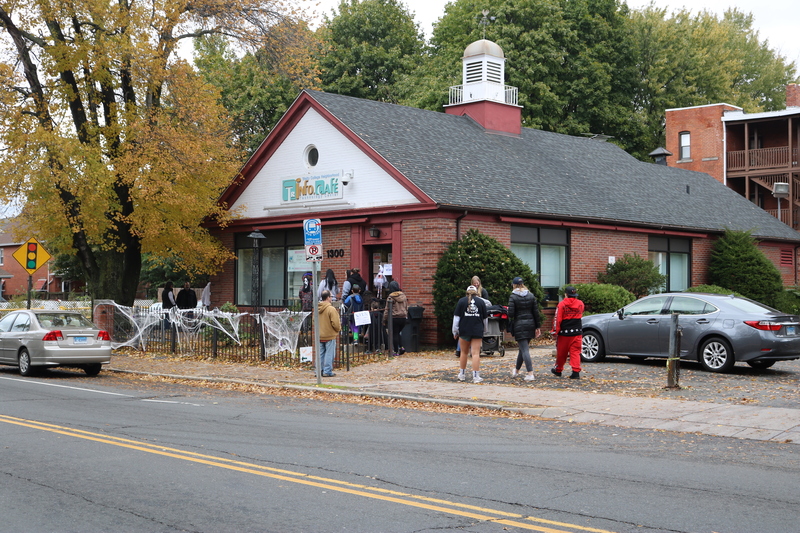 Inside Trinfo, there was a space for movies and crafts for kids who needed some quieter time. 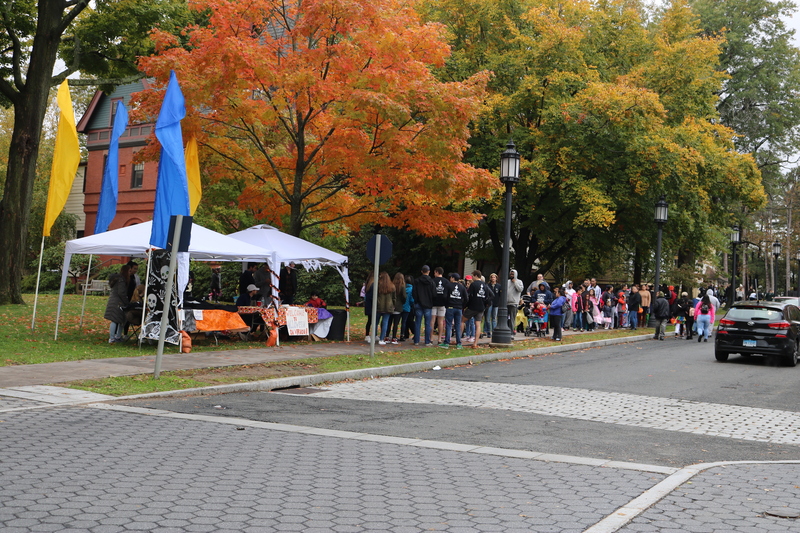 It’s safe to say that the 29th Annual Halloween on Vernon Street was a success. This event would not be possible without the leadership of Alex Donald ‘19 and Lexie Axon ‘19, of ACES, all the student volunteers, Carlos Espinosa and Arianna Basche at Trinfo Cafe, and of course Joe Barber and the Office of Community Service and Civic Engagement.